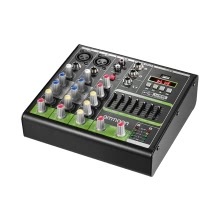 Mixing console with mono TRS & XLR input channels and stereo RCA input channel. Each channel has GAIN, 2-band EQ(HIGH & LOW), EFFECT and PEAK control knobs. With built-in 48V phantom power for condenser microphones. With TRS output jacks(L & R) and stereo headphone output. With USB interface for connecting MP3 player, and also supports connecting your device via BT. 7-band stereo graphic equalizer for adjusting the sound of the signal send to the MAIN OUT jacks. Compact size design with LED display; metal shell, portable and durable.